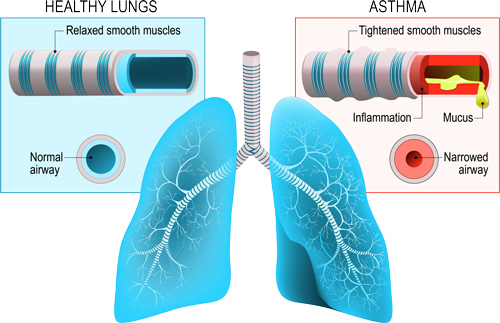 Asthma is a chronic condition affecting the lungs. Asthma can affect people of all ages, but often it starts in childhood. The disease is due to the narrowing of the bronchial airways from inflammation along with the smooth muscle tightening causing bronchoconstriction episodes. *Symptoms can vary from person to person as to the actual symptom as well as time of occurrence. *Asthma has no cures, but is manageable with today’s treatments. Moderate to severe asthma may require the use of certain infusion and injectable medications. For additional information please visit American Academy of Allergy, Asthma & Immunology.